Robotics is the science and technology of robots, their design, manufacture, and application. Robotics requires a working knowledge of electronics, mechanics and software, and is usually accompanied by a large working knowledge of many subjects. A person working in the field is a roboticist. Although the appearance and capabilities of robots vary vastly, all robots share the features of a mechanical, movable structure under some form of autonomous control. The structure of a robot is usually mostly mechanical and can be called a kinematic chain (its functionality being similar to the skeleton of the human body). The chain is formed of links (its bones), actuators (its muscles) and joints which can allow one or more degrees of freedom. Most contemporary robots use open serial chains in which each link connects the one before to the one after it. These robots are called serial robots and often resemble the human arm. Some robots, such as the Stewart platform, use closed parallel kinematic chains. Other structures, such as those that mimic the mechanical structure of humans, various animals and insects, are comparatively rare. However, the development and use of such structures in robots is an active area of research (e.g. biomechanics). Robots used as manipulators have an end effector mounted on the last link. This end effector can be anything from a welding device to a mechanical hand used to manipulate the environment. According to the Oxford English Dictionary, the word robotics was first used in print by Isaac Asimov, in his science fiction short story "Liar! ", published in May 1941 in Astounding Science Fiction. Robotics is based on the word "robot" coined by science fiction author and Nobel Prize winner Karel ÄŒapek in his 1920 theater play R.U.R. (Rossum's Universal Robots, in Czech Rossumovi univerzÃ¡lnÃ­ roboti). The word robot comes from the word robota meaning "self labor", and, figuratively, "drudgery" or "hard work" in Czech and Slovak. The origin of the word is the Old Church Slavonic rabota "servitude" ("work" in contemporary Russian). Asimov was unaware that he was coining the term for a new field -- as the design of electrical devices is called electronics, so the design of robots could be appropriately called robotics. Before the coining of the term, however, there was interest in ideas similar to robotics (namely automata and androids) dating as far back as the 8th or 7th century BC. In the Iliad, the god Hephaestus made talking handmaidens out of gold. Archytas of Tarentum is credited with creating a mechanical Pigeon in 400 BC. Robots are used in industrial, military, exploration, home making, and academic and research applications. A robot leg, powered by Air Muscles. The actuators are the 'muscles' of a robot; the parts which convert stored energy into movement. By far the most popular actuators are electric motors, but there are many others, some of which are powered by electricity, while others use chemicals, or compressed air. Motors: By far the vast majority of robots use electric motors, of which there are several kinds. DC motors, which are familiar to many people, spin rapidly when an electric current is passed through them. They will spin backwards if the current is made to flow in the other direction. Stepper motors: As the name suggests, stepper motors do not spin freely like DC motors, they rotate in steps of a few degrees at a time, under the command of a controller. This makes them easier to control, as the controller knows exactly how far they have rotated, without having to use a sensor. Therefore they are used on many robots and CNC machining centres. Piezo motors: A recent alternative to DC motors are piezo motors, also known as ultrasonic motors. These work on a fundamentally different principle, whereby tiny piezoceramic legs, vibrating many thousands of times per second, walk the motor round in a circle or a straight line. The advantages of these motors are incredible nanometre resolution, speed and available force for their size. These motors are already available commercially, and being used on some robots. Air muscles: The air muscle is a simple yet powerful device for providing a pulling force. When inflated with compressed air, it contracts by up to 40% of its original length. The key to its behavior is the braiding visible around the outside, which forces the muscle to be either long and thin, or short and fat. Since it behaves in a very similar way to a biological muscle, it can be used to construct robots with a similar muscle/skeleton system to an animal. For example, the Shadow robot hand uses 40 air muscles to power its 24 joints. Electroactive polymers: Electroactive polymers are a class of plastics which change shape in response to electrical stimulation. They can be designed so that they bend, stretch or contract, but so far there are no EAPs suitable for commercial robots, as they tend to have low efficiency or are not robust. Indeed, all of the entrants in a recent competition to build EAP powered arm wrestling robots, were beaten by a 17 year old girl. However, they are expected to improve in the future, where they may be useful for microrobotic applications. Robots which must work in the real world require some way to manipulate objects; pick up, modify, destroy or otherwise have an effect. Thus the 'hands' of a robot are often referred to as end effectors, while the arm is referred to as a manipulator. Most robot arms have replacable effectors, each allowing them to perform some small range of tasks. Some have a fixed manipulator which cannot be replaced, while a few have one very general purpose manipulator, for example a humanoid hand. Grippers: A common effector is the gripper. In its simplest manifestation it consists of just two fingers which can open and close to pick up and let go of a range of small objects. See End effectors . Vacuum Grippers: Pick and place robots for electronic components and for large objects like car windscreens, will often use very simple vacuum grippers. These are very simple astrictive devices, but can hold very large loads provided the prehension surface is smooth enough to ensure suction. General purpose effectors: Some advanced robots are beginning to use fully humanoid hands, like the Shadow Hand and the Schunk hand. These highly dexterous manipulators, with as many as 20 degrees of freedom and hundreds of tactile sensors can be difficult to control. The computer must consider a great deal of information, and decide on the best way to manipulate an object from many possibilities. For the definitive guide to all forms of robot endeffectors, their design and usage consult the book "Robot Grippers" . 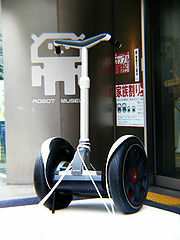 Segway in the Robot museum in Nagoya. For simplicity, most mobile robots have four wheels. However, some researchers have tried to create more complex wheeled robots, with only one or two wheels. Two-wheeled balancing: While the Segway is not commonly thought of as a robot, it can be thought of as a component of a robot. Several real robots do use a similar dynamic balancing algorithm, and NASA's Robonaut has been mounted on a Segway. Ballbot: Carnegie Mellon University researchers have developed a new type of mobile robot that balances on a ball instead of legs or wheels. "Ballbot" is a self-contained, battery-operated, omnidirectional robot that balances dynamically on a single urethane-coated metal sphere. It weighs 95 pounds and is the approximate height and width of a person. Because of its long, thin shape and ability to maneuver in tight spaces, it has the potential to function better than current robots can in environments with people. ZMP Technique: The Zero Moment Point (ZMP) is the algorithm used by robots such as Honda's ASIMO. The robot's onboard computer tries to keep the total inertial forces (the combination of earth's gravity and the acceleration and deceleration of walking), exactly opposed by the floor reaction force (the force of the floor pushing back on the robot's foot). In this way, the two forces cancel out, leaving no moment (force causing the robot to rotate and fall over). However, this is not exactly how a human walks, and the difference is quite apparent to human observers, some of whom have pointed out that ASIMO walks as if it needs the lavatory. ASIMO's walking algorithm is not static, and some dynamic balancing is used (See below). However, it still requires a smooth surface to walk on. Hopping: Several robots, built in the 1980s by Marc Raibert at the MIT Leg Laboratory, successfully demonstrated very dynamic walking. Initially, a robot with only one leg, and a very small foot, could stay upright simply by hopping. The movement is the same as that of a person on a pogo stick. As the robot falls to one side, it would jump slightly in that direction, in order to catch itself. Soon, the algorithm was generalised to two and four legs. A bipedal robot was demonstrated running and even performing somersaults. A quadruped was also demonstrated which could trot, run, pace and bound. For a full list of these robots, see the MIT Leg Lab Robots page. Dynamic Balancing: A more advanced way for a robot to walk is by using a dynamic balancing algorithm, which is potentially more robust than the Zero Moment Point technique, as it constantly monitors the robot's motion, and places the feet in order to main stability. This technique was recently demonstrated by Anybots' Dexter Robot, which is so stable, it can even jump. Passive Dynamics: Perhaps the most promising approach utilises passive dynamics where the momentum of swinging limbs is used for greater efficiency. It has been shown that totally unpowered humanoid mechanisms can walk down a gentle slope, using only gravity to propel themselves. Using this technique, a robot need only supply a small amount of motor power to walk along a flat surface or a little more to walk up a hill. This technique promises to make walking robots at least ten times more efficient than ZMP walkers, like ASIMO. f robots are to work effectively in homes and other non-industrial environments, the way they are instructed to perform their jobs, and especially how they will be told to stop will be of critical importance. The people who interact with them may have little or no training in robotics, and so any interface will need to be extremely intuitive. Science fiction authors also typically assume that robots will eventually communicate with humans by talking, gestures and facial expressions, rather than a command-line interface. Although speech would be the most natural way for the human to communicate, it is quite unnatural for the robot. It will be quite a while before robots interact as naturally as the fictional C3P0. Speech recognition: Interpreting the continuous flow of sounds coming from a human (speech recognition), in real time, is a difficult task for a computer, mostly because of the great variability of speech. The same word, spoken by the same person may sound different depending on local acoustics, volume, the previous word, whether or not the speaker has a cold, etc.. It becomes even harder when the speaker has a different accent. Nevertheless, great strides have been made in the field since Davis, Biddulph, and Balashek designed the first "voice input system" which recognized "ten digits spoken by a single user with 100% accuracy" in 1952. Currently, the best systems can recognise continuous, natural speech, up to 160 words per minute, with an accuracy of 95%. Gestures: One can imagine, in the future, explaining to a robot chef how to make a pastry, or asking directions from a robot police officer. On both of these occasions, making hand gestures would aid the verbal descriptions. In the first case, the robot would be recognising gestures made by the human, and perhaps repeating them for confirmation. In the second case, the robot police officer would gesture to indicate "down the road, then turn right". It is quite likely that gestures will make up a part of the interaction between humans and robots. A great many systems have been developed to recognise human hand gestures. Facial expression: Facial expressions can provide rapid feedback on the progress of a dialog between two humans, and soon it may be able to do the same for humans and robots. A robot should know how to approach a human, judging by their facial expression and body language. Whether the person is happy, frightened or crazy-looking affects the type of interaction expected of the robot. Likewise, a robot like Kismet can produce a range of facial expressions, allowing it to have meaningful social exchanges with humans. Personality: Many of the robots of science fiction have personality, and that is something which may or may not be desirable in the commercial robots of the future. Nevertheless, researchers are trying to create robots which appear to have a personality: i.e. they use sounds, facial expressions and body language to try to convey an internal state, which may be joy, sadness or fear. One commercial example is Pleo, a toy robot dinosaur, which can exhibit several apparent emotions. The mechanical structure of a robot must be controlled to perform tasks. The control of a robot involves three distinct phases - perception, processing and action (robotic paradigms). Sensors give information about the environment or the robot itself (e.g. the position of its joints or its end effector). This information is then processed to calculate the appropriate signals to the actuators (motors) which move the mechanical structure. The processing phase can range in complexity. At a reactive level, it may translate raw sensor information directly into actuator commands. Sensor fusion may first be used to estimate parameters of interest (e.g. the position of the robot's gripper) from noisy sensor data. An immediate task (such as moving the gripper in a certain direction) is inferred from these estimates. Techniques from control theory convert the task into commands that drive the actuators. At longer time scales or with more sophisticated tasks, the robot may need to build and reason with a "cognitive" model. Cognitive models try to represent the robot, the world, and how they interact. Pattern recognition and computer vision can be used to track objects. Mapping techniques can be used to build maps of the world. Finally, motion planning and other artificial intelligence techniques may be used to figure out how to act. For example, a planner may figure out how to achieve a task without hitting obstacles, falling over, etc. Control systems may also have varying levels of autonomy. Direct interaction is used for haptic or tele-operated devices, and the human has nearly complete control over the robot's motion. Operator-assist modes have the operator commanding medium-to-high-level tasks, with the robot automatically figuring out how to achieve them. An autonomous robot may go for extended periods of time without human interaction. Higher levels of autonomy do not necessarily require more complex cognitive capabilities. For example, robots in assembly plants are completely autonomous, but operate in a fixed pattern. The study of motion can be divided into kinematics and dynamics. Direct kinematics refers to the calculation of end effector position, orientation, velocity and acceleration when the corresponding joint values are known. Inverse kinematics refers to the opposite case in which required joint values are calculated for given end effector values, as done in path planning. Some special aspects of kinematics include handling of redundancy (different possibilities of performing the same movement), collision avoidance and singularity avoidance. Once all relevant positions, velocities and accelerations have been calculated using kinematics, methods from the field of dynamics are used to study the effect of forces upon these movements. Direct dynamics refers to the calculation of accelerations in the robot once the applied forces are known. Direct dynamics is used in computer simulations of the robot. Inverse dynamics refers to the calculation of the actuator forces necessary to create a prescribed end effector acceleration. This information can be used to improve the control algorithms of a robot. In each area mentioned above, researchers strive to develop new concepts and strategies, improve existing ones and improve the interaction between these areas. To do this, criteria for "optimal" performance and ways to optimize design, structure and control of robots must be developed and implemented. Robotics as an undergraduate area of study is fairly common. In the US, Universities that have degrees focused on robotics include Carnegie Mellon University, MIT and UCLA . In Australia, there are Bachelor of Engineering degrees at Deakin University, Flinders University, Swinburne University of Technology, and the University of Western Sydney. Others offer degrees in Mechatronics. In the UK, Robotics degrees are offered by a number of institutions including the University of Essex, Heriot-Watt University, the University of Liverpool, University of Reading, Sheffield Hallam University, Staffordshire University,University of Sussex, The Robert Gordon University and University of Tunku Abdul Rahman. 1- Definition of robotics - Merriam-Webster Online Dictionary. 2-Industry Spotlight: Robotics from Monster Career Advice. 3- Asimov, Isaac (2003). Gold. Eos. 4- Deborah Levine Gera. Ancient Greek Ideas on Speech, Language, and Civilization. 7- Piezo LEGSÂ® - Technology. Piezomotor. 9- Nishibori et al. (2003). "Robot Hand with Fingers Using Vibration-Type Ultrasonic Motors (Driving Characteristics)". Journal of Robotics and Mechatronics. 11-Shadow Robo.t Company: Air Muscles. 13-Yoseph Bar-Cohen (2002). "Electro-active polymers: current capabilities and challenges" (PDF). Proceedings of the SPIE Smart Structures and Materials Symposium. 14- Graham-Rowe, Duncan (2002-03-08). "Arm wrestling robots beaten by a teenaged girl". New Scientist. 15-Otake et al. (2001). "Shape Design of Gel Robots made of Electroactive Polymer Gel" (PDF). 17- What is a a robotic end-effector?. ATI Industrial Automation (2007). 18- Crane, Carl D.; Joseph Duffy (1998-03). Kinematic Analysis of Robot Manipulators. Cambridge University Press. 19- Allcock, Andrew (2006-09). Anthropomorphic hand is almost human. Machinery. 22- ROBONAUT Activity Report. NASA (2004-02). 23- Carnegie Mellon. "Carnegie Mellon Researchers Develop New Type of Mobile Robot That Balances and Moves on a Ball Instead of Legs or Wheels". Press release. 25-Achieving Stable Walking. Honda Worldwide. 26- Funny Walk. Pooter Geek (2004-12-28). 27-ASIMO's Pimp Shuffle. Popular Science (2007-01-09). 30-3D Biped (1989-1995). MIT Leg Laboratory. 31 Quadruped (1984-1987). MIT Leg Laboratory. 34- Dexter Jumps video. YouTube (2007-03). 35- Collins, Steve; Wisse, Martijn; Ruina, Andy; Tedrake, Russ (2005-02-11). "Efficient bipedal robots based on passive-dynamic Walkers" (PDF). Science (307): 1082-1085. 36- Collins, Steve; Ruina, Andy. "A bipedal walking robot with efficient and human-like gait". Proc. IEEE International Conference on Robotics and Automation..
37- Testing the Limits page 29. Boeing. 38- Miller, Gavin. Introduction. snakerobots.com. 41- Commercialized Quadruped Walking Vehicle "TITAN VII". Hirose Fukushima Robotics Lab. 42- Plen, the robot that skates across your desk. SCI FI Tech (2007-01-23). 43- Sfakiotakis, et al. (1999-04). "Review of Fish Swimming Modes for Aquatic Locomotion" (PDF). IEEE Journal of Oceanic Engineering. 44- Richard Mason. What is the market for robot fish?. 45- Robotic fish powered by Gumstix PC and PIC. Human Centred Robotics Group at Essex University. 46- Witoon Juwarahawong. Fish Robot. Institute of Field Robotics. 48- Fournier, Randolph Scott., and B. June. Schmidt. "Voice Input Technology: Learning Style and Attitude Toward Its Use." Delta Pi Epsilon Journal 37 (1995): 1_12. 49- History of Speech & Voice Recognition and Transcription Software. Dragon Naturally Speaking. 50- Waldherr, Romero & Thrun (2000). "A Gesture Based Interface for Human-Robot Interaction" (PDF). Kluwer Academic Publishers. 51- Markus Kohler. Vision Based Hand Gesture Recognition Systems. University of Dortmund. 52 - Kismet: Robot at MIT's AI Lab Interacts With Humans. Sam Ogden.